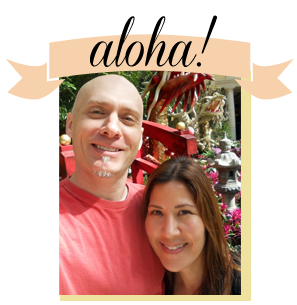 Yesterday, cakelava celebrated 6 AMAZING years of making cakes on Oahu! Thousands of cakes and smiles (and blood, sweat, and tears) and we can't wait to see what the future has in store for us! Besides turning Six, we had another big reason to celebrate March 1st. In one of our proudest moments in our cake career, cakelava was honored to receive the Editor's award for "Best Custom Cakes" by HONOLULU Magazine in their Annual "Best of Honolulu" issue. To our knowledge it was the first time HONOLULU Magazine had this specific category. They've had other dessert-related awards but not "Custom Cakes" and we were thrilled to have the honor! As if that wasn't a SWEET recognition, Rick was asked to design a cake specifically for the issue that had the words "Best of HONOLULU" on it. 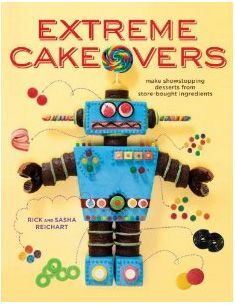 We knew at the time there was a possibility the cake could end up on the cover, but as with media, there are no guarantees, and all we could do was keep our fingers crossed and hope! 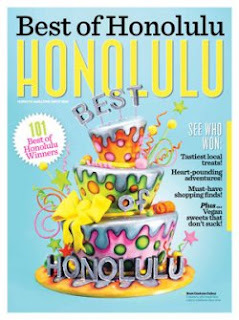 We were ecstatic when we found out we got the coveted cover shot for our favorite issue of the year, "Best of Honolulu"! We knew at that moment that March was going to be completely crazy for us. In less than a week we will be up in Canada where Rick will be teaching, and the March issue of HONOLULU Magazine was just released in stores and will be everywhere. The next couple of weeks will be hectic but exciting! 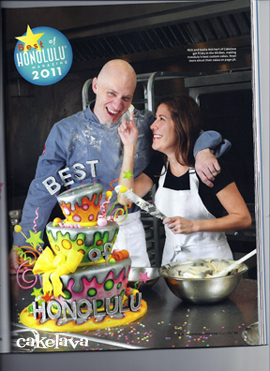 We got an advance issue of the magazine and our jaws dropped when we saw the cake on the cover in addition to a full page of Rick and I in our kitchen to introduce the "Best of Honolulu" awards. Plus the actual award, which was a very flattering write-up about our cakes. We're walking on clouds as we blow out our 6 birthday candles on the cake! A huge Mahalo to the Art design and Editorial staff of HONOLULU Magazine for featuring us! You must be so proud. Congratulations! Thanks, Angela! It was a huge honor and we're very proud. We'll see you soon! Congratulations on an outstanding 6 years! You two look so great in that photo - can't wait to meet you both next week! Thank you, Juanita! We did so many takes for that one photo. Rick had to be covered with just the right amount of flour and I don't know how many times I put a dollop of buttercream on his face. The buttercream started warming up during the shoot and towards the end was slowly sliding down his face. Needless to say, it was a lot of fun and we're very happy with the photo and the award! See you next week! Congrats that is amazing! Very well deserved as well! Very excited to meet the both of you next week! Eeeekk....so excited! How exciting and what an honor, congratulations!!! You're so sweet, Kathia, thank you!! I am sooo HAPPY for you both!!!!! CONGRATULATIONS!!!!! CAKELAVA deserves it! The best cakes ever!!!!!!! Thank you SO much, Moana! Frost us all forever! The mag cover is fabulous I can just imagine the bliss of that first taste... A well deserved, very expected and not surprising Award. You've always delivered expertly and all your creations are more than magnificent. I bet it's the best sugar rush ever! Thank you Marisa for the lovely compliment! Yes, it was a huge sugar rush to receive the award! :) Thanks for your support!